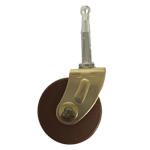 Casters and Toe Caps Casters and toe caps add modern function and vintage form to the legs and feet of your antique or reproduction furniture – and Kennedy Hardware is your one-stop shop for a great assortment of these items. 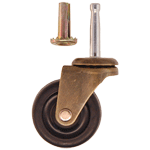 Casters If you need your large furniture to be movable whenever the need arises, we've got a broad selection of casters in a variety of materials. Whether your furniture originally had these pieces you need to replace, or you simply want to add new mobility, our selection can help you accomplish the look and functionality you want. 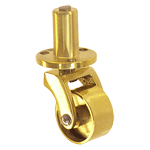 Depending on the style and wheel diameter you would like to match, you can choose casters from Kennedy Hardware made of wood, rubber, porcelain, brass, or brass plated metal. 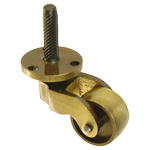 We stock varieties that can be installed via spindles into existing sockets (or you can order the sockets from us), as well as casters with threaded screws, and other designs you can install with tap-in stems or mounting plates. 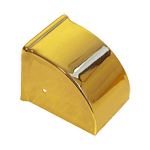 What's more, we stock additional types that can be installed over table or chair legs via fitted round or square cups. 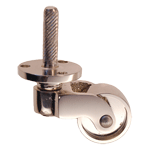 No matter the design or construction of your base furniture piece, chances are Kennedy Hardware has casters to fit! 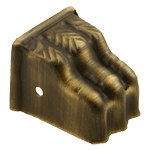 Toe Caps Toe caps, also sometimes called claw feet or pawfoot designs, add a decorative protective cover for the feet of tables, cabinets or other furniture with leg supports. Designed and manufactured to add an authentic antique look to your vintage or reproduction furniture, these toe caps can be an eye-catching conversation piece unto themselves! 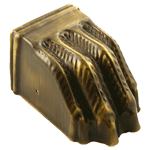 We offer claw foot designs in three sizes (small, medium and large) in either stamped brass or antique brass finishes. 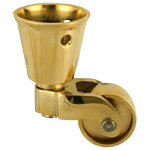 We also carry a large stamped brass Duncan Phyfe toe cap design, as well as a distinctive cast brass claw foot with glass ball that serves as a perfect accent for tables and piano stools. 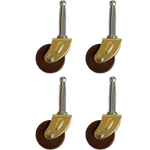 Browse our selection of popular and distinctive casters and toe caps by clicking the product categories below. Want Quick Shipping? We Can Do That! 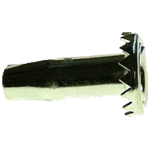 Here at Kennedy Hardware, we offer quick shipping on all orders, as well as wholesale pricing discounts on orders over $133.00. Check out our complete product selection and order today!